ok, ok, just pretend I've waffled on about how long it's been since i last posted, and how useless I am at blogging, and how I wish I was better at it..
Then we'll get on with my purpose. It's a cybercrop weekend over at A Trip Down Memory Lane, and dh has taken A out shopping, so I've got some time to play. The first couple of classes aren't really for me - just because I've been having a clearout and realised I already have a tonne of Mini books to be filled - oops! I'm going to add this to the steadily growing collection to be sold later this year for Charity. 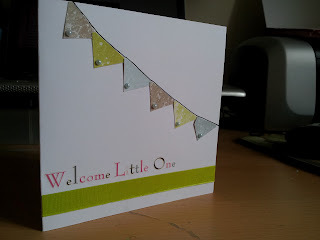 Lovely card Kathryn, the colours are perfect for a new baby card. Challenge 6 - Scraplift it!